Again, The Rock Slide® comes out swinging and gets the highest score on this Guitar Muse review tied with another manufacturer. These guys specifically noted that it had superior sustain and was killer for acoustic slide guitar & electric slide guitar. Earning a glowing review and making it into their personal stash is a very cool spot to be when you are talking about an extensive review from Little Brother Blues! They answer a question we get all the time, “Can I use this guitar slide on my dobro, resonator or acoustic guitar?”. YES, you will find the tone of a Rock Slide® to be richer than other brass or glass slides. Does The Rock Slide® work for acoustic slide guitar? Does it sound better than a glass guitar slide or ceramic guitar slide? Find out in this glowing review from the revered Acoustic Guitar Magazine in the UK! A 5 star review in Guitarist Magazine in the UK is as good as it gets. These guys sift through hundreds of demos and only review the best. Ben Miller and Eric Dahl talk Rock Slide® during Rock and Review on WZTV Fox 17 Nashville 12/12/12. We are glad that they found The Rock Slide to be not just a gimmick, but truly the best guitar slide available. The Rock Slide has been getting 5 star reviews since 1999 when it launched. The Rock Slide® was featured in Music Radar’s Top 10 Music Gear of 2012 review. These guys are very well respected in the UK when it comes to music related stuff. They felt The Rock Slide was the most well thought out electric guitar slide, and it must have blown their minds when they played acoustic slide or pedal steel slide with it! 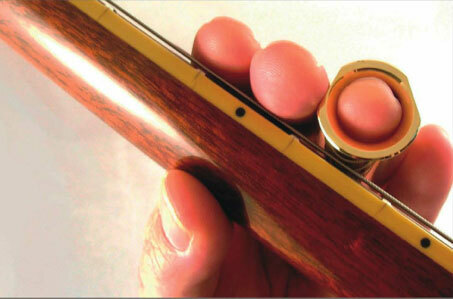 The Rock Slide® Guitar Slide is the creation of Mark Morse, a guitarist who wanted more from a guitar slide. Morse found most conventional slides uncomfortable because they’d pinch the fleshy part of his finger when he’d bend his hand into playing position. That frustration led to experimentation with the shape of the slide and research on commonly used materials. What makes the Rock Slide® different is the way it’s shaped. The angled opening on one side of the slide is cut away to reduce pinching of your hand and finger. The inside of the slide is shaped to provide a better fit, so it will stay in place more snugly. The top (where the finger sticks out) is thicker and heavier. In addition, the flat surface on the opposite exterior end provides a comfortable rest between the slide finger and its neighbor. Depending on the dimensions of your fingers, the pinky and ring slides may fit on the top part of your finger, or all the way down to the base of your hand. It can be used either way, and the snug fit will provide better control. Two sizes are currently available – one for ring and pinky fingers, and another for middle fingers. The Rock Slide® is available in solid brass and chrome-plated. For a test run, we raised the action on our trusty Les Paul just a bit (it was fairly low), and checked out both models. Since my hands are small, the slides fit over my fingers (as typical slides are intended to fit). The angled and beveled edges certainly did provide better comfort, and helped hold the slide in position, so it was easier to control. The ring/pinky slide fit on my ring finger up to the knuckle, so I was able to use it more like a ring slide. It also stayed in place comfortably. Part of the reason I’m not a better slide player is I was never able to find any slides that fit comfortably. Fortunately, with the growing selection of accessories available today, I’ve found a few, like the Rock Slide®, that are encouraging me to improve. The Rock Slide® is becoming easier to locate in music shops. If your favorite dealer doesn’t have it, have them check out the company’s website.